COLLEGE PARK, Md. 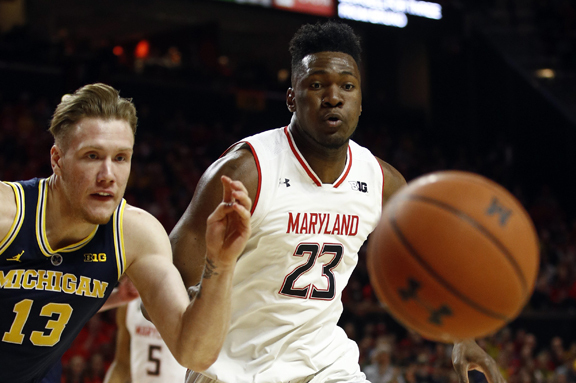 — Playing with intensity and emotion after being cut down to size in defeat, Michigan used a strong performance from its relentless starting lineup to remain in the hunt for the Big Ten title. The Wolverines (26-4, 15-4) clinched a double-bye in the conference tournament and could overtake Purdue. Michigan must win its finale at Michigan State and hope the Boilermakers lose at least one of their last two. Simpson added a desperation running hook in the final seconds of the shot clock for an eight-point lead with 4:38 left.